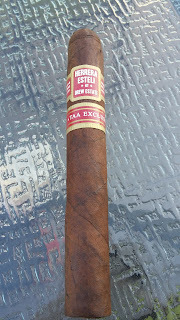 Background: The Herrera Esteli TAA Exclusive comes as a release from the Tobacconists’ Association of America meeting. This meeting is where cigar retailers meet at a trade show together to discuss a variety of issues that face the cigar industry. This year’s meeting was held in Puerto Vallarta Mexico. Willy Herrera, Drew Estate’s Master Blender, is quite well known for a number of his blends and he damn well should be. This one is actually the first time he is utilizing a Connecticut Broadleaf as a part of DE. 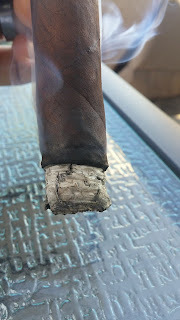 With DE’s successes with the wrapper on the Liga Privada No. 9 line, this one is definitely has the chance to turn heads. Appearance (0-20): The wrapper immediately stands out. It’s a nice rich color that reminds me of a coffee with just a touch of cream. There are absolutely no blemishes to note, only small veins, and the wrap job is well done. The bands are a nice quality, with a darker red backing set against gold and white. 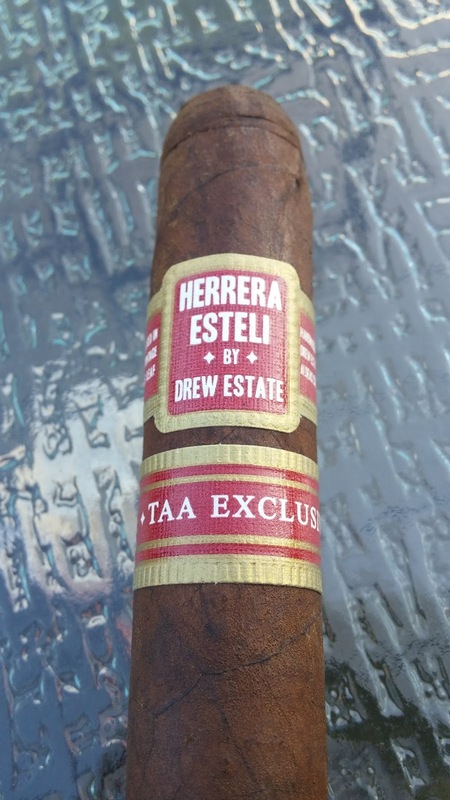 The upper band denoted this as the “Herrera Esteli by Drew Estate”. The lower of the two bands puts it as the “TAA Exclusive”. It definitely looks good and will stand out against the rest of the cigars out there. Construction (0-20): Everything felt pretty well packed and solid with no gaps to speak of. Initial cut was relatively clean, with only a small amount of debris. The pull on it was slightly tight, but I had hopes that it would loosen up when the smoking began. After lighting, the first few puffs were still slightly tight but it loosened up to the perfect drawl pretty quickly. The white ash seemed slightly flaky but ended up sticking on there for about 2 inches at a time, with a clean line and no touch ups. Strength (0-20): Full – while it may be listed there, it isn’t a huge blast of harsh strength that you are met with. Instead this one begins in the medium range and slowly builds throughout the cigar, where it finally rests in the full spectrum. Flavor (0-20): The first puffs on this give a really heavy cinnamon spice. We are talking the type where you have a cinnamon tea or a strong gingersnap. It’s really nice when paired with the element of citrus that comes through with it. There’s a bitterness there too, right off the bat, which is reminiscent of a really strong coffee. Inherently, a bit of chocolate sweetness counters these flavors, along with a spicy pepper kick. It takes me to a place when I had some strong Mexican chocolate coffee, with a little added pepper and citrus to the mix. Now mind you all of this happens within the first third of the cigar. It’s well balanced in the flavors, but doesn’t progress any further. 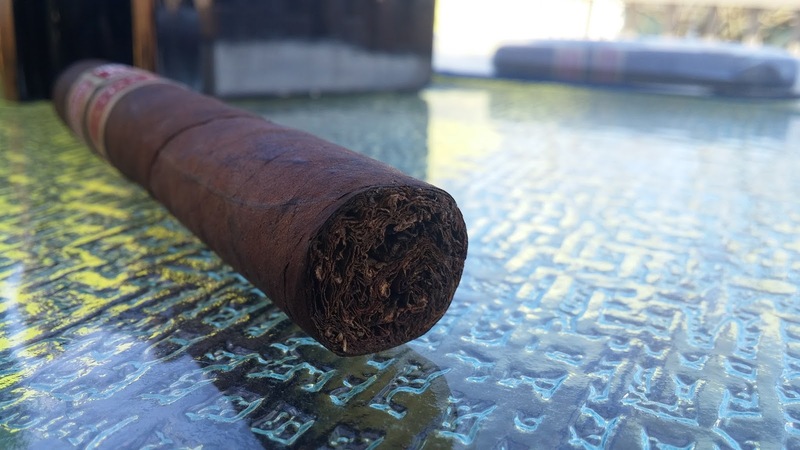 The entire remainder of the cigar is different deviations of the base flavors noted. 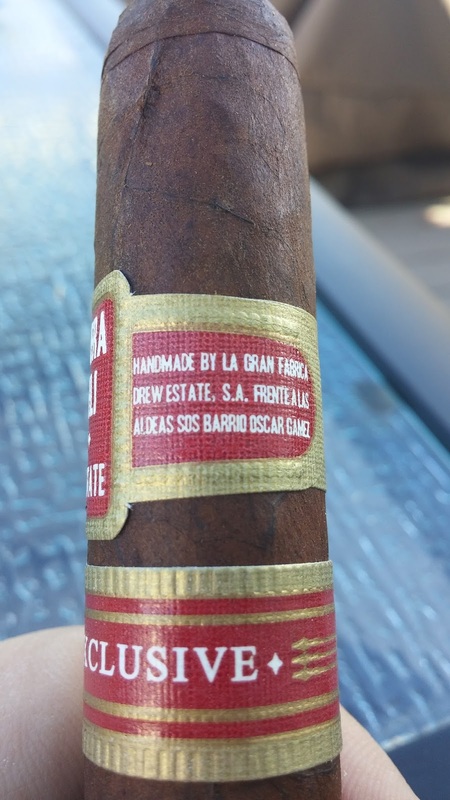 Value (0-20): $12 for a stick is in line with a number of the other Drew Estate products, but for this one in particular, I think it’s a bit high. Additional Notes: Paired with water. Cigar provided by Drew Estate. Overall (0-100): When it was announced that there was a new Herrera blend coming out using the Connecticut Broadleaf, I was pretty excited. Picking it up and it felt and looked great. The price seemed a little steep but in line with other DE stuff, so it wasn’t totally unexpected. But the flavor got me. Bare-bones – I enjoy the flavor. It’s good. Hell, its really good. I’m a big fan of Mexican chocolate, coffee, and citrus being mixed and essentially that’s what you get with this cigar. The transitions are almost seamless throughout and really it’s pleasing. Usually I would say that the problem is that it lacked complexity beyond what you get in the first inch or so of the cigar, as this smoke deviates the same flavors to various extents. 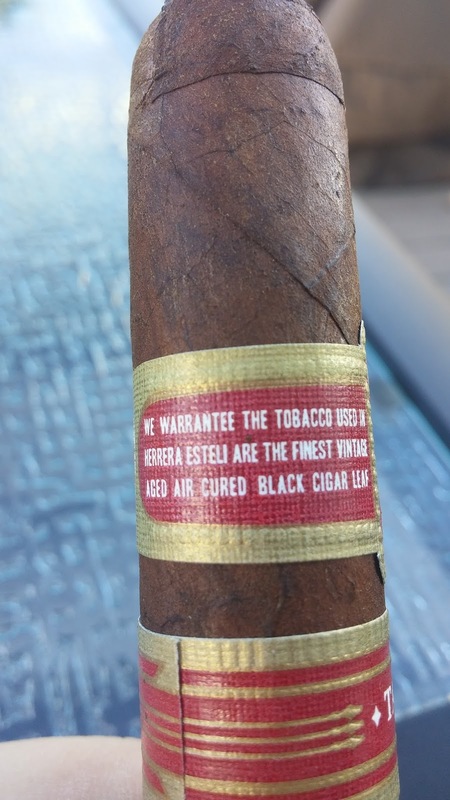 But this time I am going to go back on that a little - the flavors are well done enough that is is absolutely worth a smoke. So would I pick this one up at $12? Not on a consistent basis. As a "once in a while" kind of smoke, where I wasn't looking for complexity, it will absolutely fit the bill.